The Myth Of “Tension” In Hernia Repair! The term “Tension-Free”, as applied to hernia repair, is a concept invented by competing hernia repair techniques (both natural-tissue and surgical mesh) to try and differentiate themselves by implying that “tension” is bad, and that their technique is better, because their repair did not introduce tension on the underlying tissue surrounding the repaired hernia defect. The reality is that tension is not the enemy of hernia repair as it exists naturally throughout the abdominal wall. All hernia repairs by their nature involve realigning tension within the abdominal wall by repairing the tear or weakness in the muscle. The key is what happens to that tension over time. Natural tissue techniques can put immediate, but minimal, tension on the muscles and surrounding tissues as they are drawn to repair the hernia, but this mild discomfort subsides quickly as the tissues stretch and compensate in the natural healing process through muscular adaptation so well described by physiologists and seen in weight lifters. 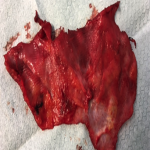 Thereafter, only the strengthened natural tissue abdominal wall remains. 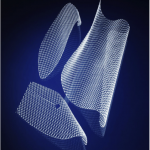 With mesh techniques, the issue is that mesh cannot match the properties of natural tissue, and this inconsistency of tension, over time, puts mechanical stress and undue long-term tension on the mesh which will shrink, crack, harden and may become displaced while dragging new entrapped nerves within its pores. There are 100’s of research papers that conclude that mesh shrinks significantly over time, and it is generally recognized that after 5 years implanted mesh will shrink up to 40%, lose the majority of its pliability and eventually turn hard into a solid mass. This can be seen in the image below of a piece of virgin mesh, prior to it being implanted, compared to a piece of extracted mesh.